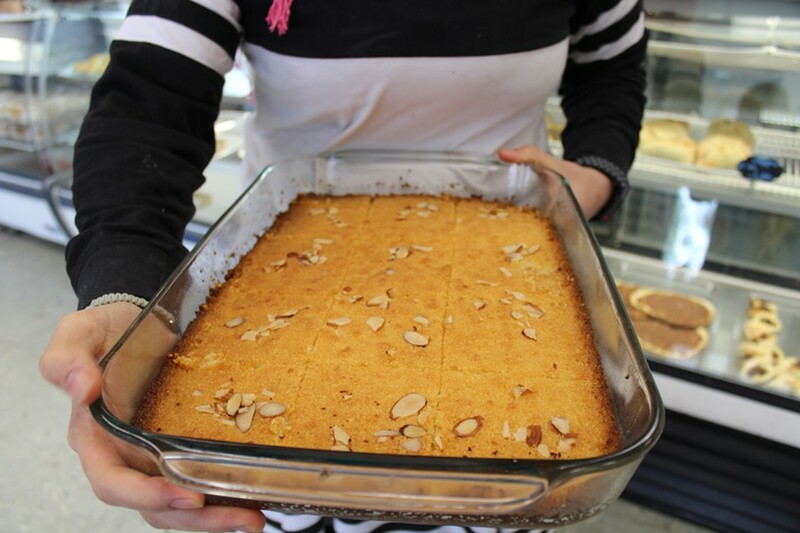 Karim Bakery does Mediterranean and Middle Eastern dessert right. No matter what country you're in, bakeries are sugar-glazed windows into the soul of a culture. There's something magical and unifying that happens during your first few steps into a bakery—sharing the aromas of fresh bread and melting butter somehow makes us forget the things that make us different and instead embrace our similarities. If this phenomenon is something you have yet to experience, consider a visit to Karim Bakery (2575 S. State, 801-645-4533). At first glance, it's an unassuming Mediterranean market with a compact bakery and dining space attached, but once you try their transcendent take on traditional flavors, it's easy to feel right at home. Karim Bakery is the passion project of Syrian immigrants Abdulkarim Alhasnawy and Zahra Altahan along with their family, who have owned, operated and managed the space since August 2017. Their daughter Ihsan explains that all of them share responsibilities, which means they're all professional and talented bakers. The menu includes a wide range of traditional Mediterranean and Middle Eastern items. Historically, treats from this region predate the spread of cane sugar, which is why texture is the star of the show and sweetness is only a backup dancer. Blankets of crisp phyllo dough keep crushed walnuts or pistachios and honey cozy within Karim's famous baklava ($1.50 for walnut; $2 for pistachio); buttery maamoul cookies (85 cents) break open to reveal dense, luxurious fillings made from either chopped dates or pistachios; and the coconut-soaked basbousa cake (pictured above; $1.50 a slice) is almost pudding-like. 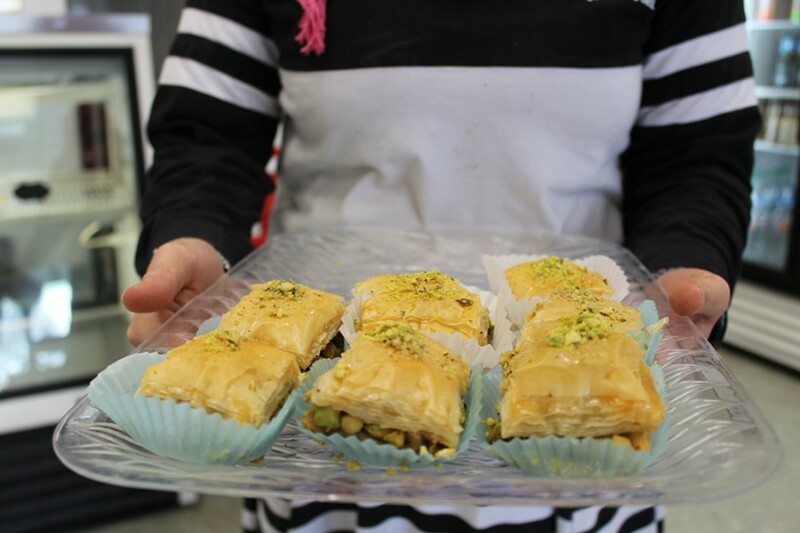 While a lot of local spots offer some variation of baklava, and it usually tastes good—honey, nuts and crunchy dough are tough to screw up—there's something different going on with Karim's. The top layers of dough are light and pleasantly crunchy as it should be, but the nuts have a much rougher chop, yielding larger overall pieces in the filling. I wouldn't have thought I'd be a fan; I like it when the nuts in my desserts are ground down to a powder, leaving only the ghost of their flavor behind. But the flavor that seeps into the dough and the thick layers of honey and syrup dig deep into the realm of caramelized, earthy goodness. And while I've eaten a lot of baklava, I feel like this was the first time I actually tasted flavors other than sweet. Recently, Karim started to offer more savory items like safeeha ($2), a housemade flatbread topped with finely ground beef, lamb and chopped tomatoes. These dishes are a bit like pizza's healthier cousin—the toppings are lean and intensely seasoned, and they leave you pleasantly devoid of cheese grease. I'm currently obsessed with the shawarma ($2), as it is a simply prepared pastry filled with beautifully seasoned lamb that has been sliced gyro-style. It's a perfect little pocket of surprisingly intense flavors, and its affordability makes it easy to get two or three—or four or five—to go. In true Mediterranean style, Karim Bakery isn't about taking a deep dive into the sugary end of the dessert pool, which is one of the reasons it's such an important part of our baking ecosystem. Every so often, I get into a baking rut where cookies, doughnuts and cakes run a bit too sweet for my sweet tooth. When I'm in such a rut, but still need something to satisfy my craving for bite-sized confections, Karim Bakery is sure to be on my rotation. Coupled with their comforting savory dishes and welcoming atmosphere, I'm happy to recommend that like-minded bakery aficionados do the same.